He has performed or recorded with Daniel Carter, William Parker, The Cinematic Orchestra, Blue Foundation among others. Federico Ughi has performed throughout Italy, the UK, France, Holland, Belgium, Denmark, Sweden, Finland, Slovenia, Portugal, Spain, Switzerland, Austria, Hungary, Poland, Belarus, Ukraine, Georgia, Russia, Lithuania, China, Mexico, Canada and the US. Federico live in Inner Mongolia with Blue Foundation. Federico live in China with Blue Foundation. Drummer Federico Ughi's Songs for Four Cities is a poetic meditation on inner and outer geography that's filled with deliciously lyrical tunes. Ughi lived in Italy until age 21, and then spent almost a decade in London before moving to his current home in New York City in 2000. The eight compositions on the CD explore these cities as well as Montreal, Canada, offering highly personal statements that form a sonic autobiography, a personal map of both disquiet and contentment in some of the greatest cities in the world. Ughi is a staple of the New York City avant-free scene, and over the years he's studied and played with some of jazz's finest musicians, including saxophonist Ornette Coleman, bassist William Parker, and multi-instrumentalist Daniel Carter. On Songs for Four Cities, he's joined by a formidable group of musicians, each with their own unique voice and depth of experience: saxophonist Darius Jones, bassist Ed Schuller, and pianist Eri Yamamoto, with spoken word on one song by phenomenal vocalist Leila Adu. As fits the theme of the album, this group is an international incident in the best sense, with Ughi from Italy, Yamamoto from Japan, Adu from New Zealand, alongside Americans Jones and Schuller. Everyone in the group is an accomplished free player, but they all have a respect for melody and an ability to get right to the heart of Ughi's beautiful compositions. Standouts include "Tolmin," a song about New York by way of Slovenia that's given liftoff by Jones' distinctive sax, as rich and piercing as a human cry. "When We Cry" speaks of Ughi's nostalgia for Rome, with pleasing shape-shifting by the quartet as its members twist and turn off the melody. "Pasolini the Painter" evokes the street life of Italy as depicted by the great Italian film director Pier Paolo Pasolini, a majestic song that starts off with Adu's compelling recitation. Another gem is "Claygate," a portrait of the artist as a weary music teacher, dreaming of a better life while taking the train from Claygate to London. It's a beautiful portrayal of frustration tempered by hope, an emotion perfectly displayed by Yamamoto's sparkling solo. And mention must be made of "Shadow Remover," a powerful tribute to New York that includes an evocative solo from Schuller. Each of the pieces on Songs for Four Cities is alight with clarity and honesty, offering a presentation of the human heart as it seeks and remembers a sense of home. The record has a sense of both searching and finding, with strands of each weaving in waves throughout the compositions. Ughi is to be commended for his distinctive songwriting and playing, as well as for creating a multifaceted work that celebrates the richness of the many worlds in which we live. Rome (where he was born), London (where he moved at the age of 20), New York (where he has been established since 2000), are the cities that mark the human and musical path of Federico Ughi. He is a drummer/composer who now is to be counted among the most interesting voices in the New York musical community, particularly in Brooklyn, where he has introduced a series of excellent appearances: Daniel Carter, William Parker, Hamid Drake, and Eri Yamamoto, to give examples of just a few - through which he has put new life into the creative energy of that scene, and has obtained visibility and appreciation himself. This new release from FMR displays the qualities of the composer as a leader, letting us in on a multi layered approach and appreciation of music that is well planned, dipping into the contemporary, and with more than a reference to the musical passions of Ughi. If you have loved and continue to love the historic quartet of Ornette Coleman with Don Cherry, this is an album that you should have. There is no explicit homage here to that revolutionary group, and there is no version more or less faithful of those famous songs. Simply stated, it is an approach to the material that is free of any thematic clichés, and with a palpable tension between what is written, and free improvisation. In all, within the confines of a space continually remodeled, with its boundaries defined, from time to time, by geometric rhythms of the drum and elastic bass lines. Within this, the mixing of the two horns creates wonderful sounds and, far from working as simply color and filler, they react, with extraordinary intensity, to the stimuli provided from time to time by the rest of the group. From esoteric themes, to references to folk traditions, to atmospheres permeated by a discrete euro-cultural allure, to the militant beat of the New York avant-garde, all come across as pleasant anomalies. The killer melody of "Circled Square," for example makes you bless the repeat play function of the CD player. and the uneven tempo, playful and politely irreverent, of "Second Day Syndrome", enhances the playfulness of music that is difficult to forget. The Federico Ughi Quartet is part of the lineage that continues to emerge from saxophonist Ornette Coleman. Ughi's work embodies a range of disparate influences, including classical music and Italian folk tunes, but in the quartet's eponymous release Ughi pays homage to Coleman's spiritual, philosophical, and musical influence. The quartet even mirrors Coleman's archetypal two-horn-bass-drums lineup, in this case David Schnug on alto sax, Kirk Knuffke on cornet, Max Johnson on bass and, of course, Ughi on drums. The group also follows Coleman's lead through blending the composed and the improvised. The dance between these two streams has intrigued—nay, haunted—jazz musicians from the inception of this music, but after years of hard work Ughi has discovered his own balance. He has also found skilled players to help realize his vision; this group plays together frequently, putting in the time and commitment necessary to create the one-mind so vital to improvisational cohesion. The essential magic in Ughi's music, however, comes from the heart. The sincerity and emotional timbre of his compositions are always palpable, whether the songs are upbeat or contemplative. "Quantunque" is a bright, bouncy piece where bending notes and moments of dissonance mingle happily with the melody. It's a sparkling tune, joyful and welcoming, and a terrific way to start off the recording. "Second Day Syndrome" is a warm, majestic song that features powerful unison work between Schnug and Knuffke. It's a pleasure to witness such spot-on front line playing, with rich energy reminiscent of classic Blue Note recordings. A fresh tune with, appropriately, many colors, the jaunty opening statement of "Technicolor" teeters on chaos, but then slows down and offers a lilting melody line infused with folk music. The song shifts moods often and displays a host of off-kilter colorations, but its vigorous drive and innate lyricism hold all the elements together beautifully. The group also excels on ballads. The spare "Song for Charles" is a moving portrait with exquisitely sinuous notes. There's a wonderful improvised conversation between the two horns, with Ughi's drums simmering in the background and Johnson's emotive arco bass providing powerful support. And "Ange" is just gorgeous, a pensive tune with a whiff of melancholy. The horns are particularly impressive here, with Schnug digging deep into a bluesy solo and Knuffke expressing a yearning from the soulful depths. This is the quartet's first release, and altogether it's a beauty. Ughi's name is usually linked with his illustrious mentors—including Coleman, bassist William Parker, and multi-instrumentalist Daniel Carter—but these days he stands alone as a fine musician in his own right, with this group just another shining example of his strengths. El italiano Federico Ughi es uno de los muchos baterías que se decide a liderar sus propias bandas y es también uno de tantos músicos de jazz europeos emigrados a Nueva York en busca de oportunidades. Desde que en el año 2000 se afincó en la gran manzana ha frecuentado los círculos del free que se mueven en torno a William Parker, destacando su estrecha colaboración con el multiinstrumentista Daniel Carter reflejada en varios discos publicados en su propio sello 577 Records. Songs For Four Cities, editado el pasado año por el sello germano Skycap e inspirado en las cuatro ciudades protagonistas de su periplo vital (Roma, Londres, Montreal y Nueva York), no es ni por asomo lo que cabría esperar con ese currículo. El cuarteto reunido para la ocasión comparte las virtudes perfectas para un primoroso ejercicio de neoclasicismo: el saxo ardiente de Darius Jones, erigido en heredero de Arthur Blythe, el piano conmovedor de Eri Yamamoto (que ya había grabado a dúo con Ughi en Duologue), y el contrabajo sobrio de Ed Schuller, que fuera miembro del quinteto de Paul Motian. Apenas algunos ramalazos de free clásico asoman en When We Cry, pero el disco responde a un único credo: la melodía por encima de todo, los ecos del cancionero tradicional italiano impregnan temas tan evocadores como Pasolini The Painter y Uno Fa Tanto. Un precioso disco que de haberlo descubierto a tiempo hubiera estado entre mis favoritos de 2012. Quartet, recien aparecido en la etiqueta británica FMR, deja clara su admiración por Ornette Coleman, con el que Ughi ha tenido la oportunidad de estudiar no hace mucho tiempo. La influencia en su música es más que patente, no en vano Ornette fue también un melodista que basaba sus improvisaciones en sencillos motivos de blues. El cuarteto, con la misma instrumentación que su modelo, cuenta con el contrabajista Max Johnson, revelación del pasado año con dos discos soberbios, el cada día más espléndido trompetista Kirk Knuffke, y el joven y para mí desconocido saxo alto David Schnug. En una onda muy diferente al anterior, más dinámica y juguetona, sigue poniendo en primer plano unas melodías infecciosas, algunas descaradamente ornettianas como Technicolor, otras tan atractivas como Circled Square, de esas que no te puedes quitar de la cabeza. Un disco aparentemente modesto, sin grandes alardes, pero que es una delicia de principio a fin. The band on drummer Federico Ughi's Songs for Four Cities features both Darius Jones and pianist Eri Yamamoto—whose own 2012 full-length also made my list—not to mention [...] Ed Schuller. The Ughi was a real sleeper for me; unlike [...] many other records I chose, this one didn't benefit from any sort of PR push whatsoever. I doubt I'd have heard of it at all if it weren't for my weekly TONY duties; I checked out Songs for Four Cities after I noticed a listing for a record-release show at Firehouse Space (a show I unfortunately didn't get to see). Before this, I had a sense of Ughi as a staunch free-jazzer, mainly affiliated with William Parker, Daniel Carter and other Vision Festival mainstays, as well as with guitarist Adam Caine, an old friend and former bandmate of mine who currently works with Ughi in a rousing freeform duo known as The Moon. 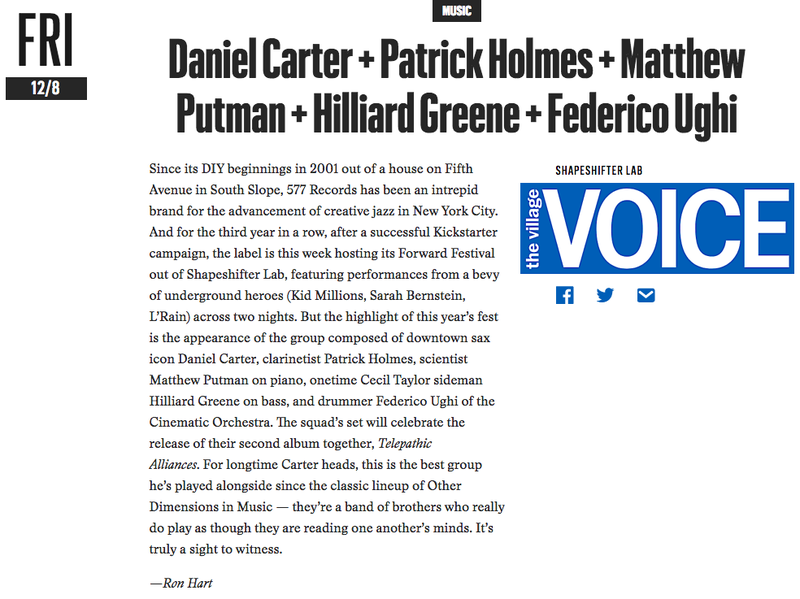 But while there are moments of old-school ecstatic-jazz catharsis on Songs, that's not the prevailing vibe here at all. No, on the contrary, this is one of the warmest, most straightforwardly approachable records I've heard in 2012, jazz or otherwise. The Songs in the title is no accident; the pieces here—inspired, as the title would suggest, by four cities around the world where Ughi has lived—feel as elemental as deep, old hymns, and as catchy as great ’70s soul. Once you've heard tracks like "Tolmin" and "Claygate," I can pretty much guarantee they'll be looping in your head. And the band plays the material with such loving respect; the themes aren't just improvisational fodder, stated and then jettisoned; Jones and Yamamoto, both proud guardians of melody in their own work, really dig into these compositions, nurturing them, seeing to it that they bloom. I'm thinking of moments like Yamamoto's solo on "Claygate"—it's just so lush and bluesy and fun and heartfelt, so extremely not about hip jazz sophistication, geared entirely to bringing out the essence of Ughi's writing and sharing it with the audience. Again, there are hints of free-jazz fire in this music, as on "When We Cry," during which the band reaches a hectic, increasingly abstract crescendo, but even here, it's not at the expense of the tune. The straighter pieces are what really put this one over the top for me, though; every time I put this record on, I marvel at its unpretentiousness—how it's not some knowing gloss on a sort of pop-jazz aesthetic (and I use pop-jazz in a totally non-pejorative sense), but a fully realized embrace of that idea, the notion that jazz, whatever its "school," should be about the song first and foremost, and about how improvisation grows from that like a flower from soil. Whatever your particular tastes, you need to hear what Ughi and his band are doing here. Bolzano. Sono sempre più numerosi i giovani strumentisti jazz italiani che decidono di trascorrere un periodo negli Stati Uniti per affinare la propria preparazione, respirando il clima musicale di New York e dintorni, certamente più stimolante di quello di tante città europee. Molti, dopo questa esperienza, perlopiù maturata nelle scuole piu' accreditate e nei club, tornano in Italia fregiandosi di questa specializzazione, nell'intento di fare breccia nel mondo sempre più saturo e difficile del jazz. Alcuni però scelgono una via piu' ardua, ma certamente di maggiore soddisfazione, fermandosi negli States e cercando la' la propria collocazione. È il caso del batterista di origine romana Federico Ughi, che dopo aver fatto da giovanissimo un'esperienza a Londra, suonando soprattutto be-bop, si è trasferito a New York nel 2000 e là si è introdotto nella scena più interessante e prolifica dell'avanguardia, quella che fa capo a locali come il Knitting Factory e il CBGB. 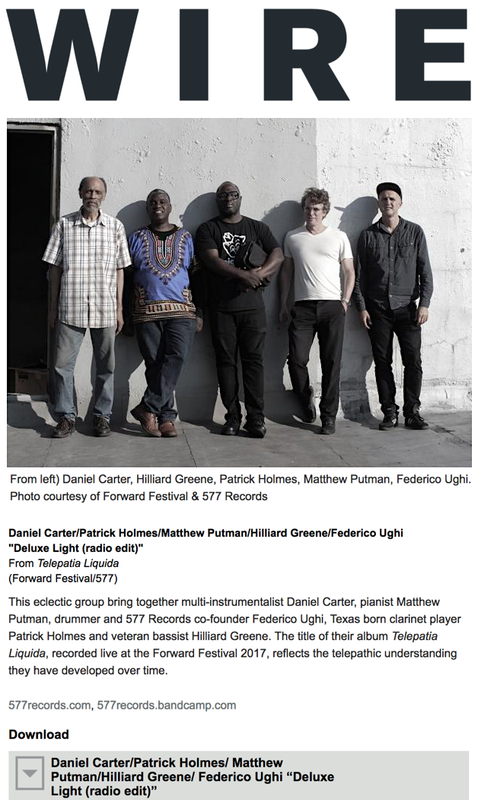 Suo è il merito, per esempio, di aver portato in Italia un paio di anni fa il polistrumentista Daniel Carter, figura leggendaria della scena afroamericana di oggi, compagno di registrazioni di Matthew Shipp e William Parker. Ora Ughi torna in Europa con il suo ultimo progetto, il quintetto Options, che ha recentemente pubblicato l'album "South Of Brooklyn", per l'etichetta 577 Records, nel quale troviamo ancora come ospite speciale Carter. E come nelle passate occasioni, il suo tour, che passa da Milano, Roma, San Marino e Slovenia, tocca anche la nostra regione, fermandosi questa sera a Bolzano, da Hopfen. Nella musica presentata da Ughi con il quintetto prevale una solida struttura compositiva, dovuta alla prolifica penna dello stesso batterista, che nei suoi brani fa balenare influenze di rock progressivo e free jazz, con uno spiccato e articolato gusto per gli incastri melodici. La formazione che completa il quintetto Options è formata dai sassofonisti Matt Glassmeyer e Nathan Hanson, dal chitarrista Sean Moran e dal contrabbassista Dan Fabricatore. A year later, and the number 'two' still carries with it a tinge of horror in New York City. Two parallel lines, two events in succession, two become none. On his new CD, New York poet and frequent improv collaborator Steve Dalachinsky never even mentions the terrorist attack of September 11, 2001. The cover is a photo of seagulls flying against a plane of blue, not a shot of destruction and devastation. But while the city's wound is healing, it's still tender. The title - the suggestion that the world ended twice - like the paranoiac strains within - don't need to spell out terror in order to explore it. The thirty-minute suite is actually about vulnerability, albeit at a sensitive time. Dalachinsky is known for his work with the best of New York's jazz and creative improv community. His earlier Knitting Factory release included Susie Ibarra, Thurston Moore, Matthew Shipp, and Daniel Carter, among numerous others. Such projects work because the poet knows how to leave plenty of room for his collaborators. Drummer and electronicist Federico Ughi is a different kind of foil, however. Rather than a jazzy state-theme-solo-and-vamp construction, Ughi creates quiet but effective washes behind the poet's words, and puts occasional live effects to Dalachinsky's voice, adding to the drama without getting in the way. The result is two artists working on an even plane, creating a single, evocative work. Per ben inquadrare questa produzione di Federico Ughi, batterista romano di giovane età da diversi anni residente a New York, occorre soffermarsi sull'idea che sta alla base del suo ULERS, progetto in fieri qui alla seconda puntata. ULERS sta per Unrehearsed Live Editing of Recorded Sounds, ovvero un montaggio a posteriori (improvvisato!) derivante da due diverse registrazioni. La prima è una registrazione di solo di batteria dello stesso musicista, che riconosciamo dal suono leggero (Ughi predilige i piatti e qualsiasi cosa che suoni leggera all'interno del drum-set) e dalle frequenti escursioni dell'espressione. La seconda è una registrazione d'ambiente, effettuata in una passeggiata di un'ora nel centro romano, che riconosciamo (oltre che, in qualche caso, dai suoni stessi) dai titoli che individuano le quattro tracce del lavoro finito. Ughi ci fa dunque riflettere sui suoni d'ambiente e sulla loro musicalità con un comporre che è qui piuttosto gesto: i due mondi (mondi reali della vita del musicista, uno esterno e l'altro interno) si incontrano virtualmente in una sorta di colonna sonora al contrario, dove il traffico e i rumori della vita di una città possono facilmente costituire il supporto su cui punteggiare il proprio discorso musicale, da qualsiasi parte del mondo esso venga enunciato. Ughi crea così 5 diversi ambienti su cui far vivere le proprie interazioni, seguendo la regola di inserire un evento musicale importante per ciascun mondo. Alla base di ciò c'è certo una familiarità con l'improvvisazione quindi una passione per l'ascolto dei suoni "emotivi" della musica concreta; Ughi, poi, non ha una pratica del montaggio invasiva, e molte sequenze restano intatte, editate o alterate con misura, oltre a conservare sempre un suono "rough" che non dispiace, e le sue soluzioni non suonano mai pretestuose. Così può succedere che il passaggio di un motorino in lontananza messo in loop può diventare una sequenza ritmica, una voce isolata porta con se tutto il suo mondo e ci emoziona, un crescendo urbano "naturale" ispira un crescendo ritmico e sonoro, rischioso e poco confortante, proprio come può essere l'ambiente in cui viviamo. Astonishment: the title may sound pretentious but for once it is well deserved. Federico Ughi and Daniel Carter's CD surprises and charms. Both players are well accustomed to free improvising, but their take on the genre is a lot more atmospheric than one would expect. Carter alternates mainly between his trumpet and alto saxophone (a touch of flute or clarinet here and there too). His short, pensive trumpet lines recall Bill Dixon. His reed playing can be a little more gutsy, but things rarely escalate over the whisper. Ughi mainly uses soft mallets, tickling the cymbals, less playing the drums than letting them release their inner vibrations. He also sings long, delicate notes he samples live to accumulate. The resulting music is dreamy, cloudy, surprisingly quiet, and gentle for a free improv session. One thinks of Ben Monder's albums with Theo Bleckmann (the two voices also share similarities), some of Pauline Oliveros' pieces, or some strange, otherworldly world music -- Astonishment emits ritualistic, incantatory vibes. Singling out a particular track would not do justice to the other ones, since they all share a similar mood and seem interconnected in a unique musical vision. This CD could be used as an entry point for someone interested in free improvisation. Wrapped up in the music you hardly notice the absence of a script until you focus your attention on either player. To be listened to with eyes closed after a particularly stressful day. Strongly recommended. Review: Federico Ughi "The Space Within"
Drum and saxophone duets can often be self-indulgent by performers and tortuous for listeners, but this set is a delight. Ughi is a sensitive drummer responsive to his partners. They in turn make full use of the space available to improvise in depth. The duos with Buckley on both Slight and In Fading Light are a true dialogue. The two parts of John Lewis's Django are fascinating both for the comprehensive reworking of the theme and the way Rachel Musson deploys the higher register of the tenor to haunting effect. Best of all to my ears, are the three baritone-drum duos that end the set, with both Ughi and Morris exploiting the full sonic possibilities of their instruments. As ever, a high-class set from Slam Productions. In the history of Jazz, duets recordings are a relatively recent form of expression. Drums and reeds alternate supportive roles as easel and canvas on Federico Ughi "The Space Within", Slam 236 where Ughi recruits three peers to join him in three separate duo incarnations. Italian by birth, Ughi has since moved about geographically making his way eventually to New York by way of an extended stay in England. The tracks on this disc are gathered from his London residency and reference him in a highly expressionist mode. Across the program he enters into a give and take with his partners, by turns pushing things forward and hanging back in the wings. His traps set is aflutter with delicately shaped accents and a strong rhythmic sense on the opening pieces with Buckley and it is here that his playing is at its most linear. Buckley cycles through folk themes that vaguely recall elements of Coleman and Ayler, but without the ecstatic edge. His bass clarinet work is more pensive in mood, but no less facile in delivery. By comparison, Musson's sound is a bit belabored in terms of emotive urgency on "Django, part one" but her tenor's tone opens up on the more ethereal "Remember" and "Django, part two". Ughi's tack also shifts on these pieces, unfurling with fine-grained flourishes on mallets and brushes. The improvisations with Morris are the darkest in hue due in part to the saxophonist's dark sonorities on his low register reed. Ughi's accompaniment is the sparest on these concluding numbers, but his drums also stand out in sharpest contrasts in conjunction with Morris. Together the three episodes contained on the disc offer a diverse array of tandem textures and point decisively towards Ughi as a solid improviser on his instrument.